Y'all, our house is actually livable now! It only took about 6 weeks to unpack everything we could, paint all the furniture that needed to be redone, order bookcases and a china cabinet, assemble said new furniture, and then be able to continue unpacking. Whew. We're finally at a place where we can relax when Gus and I are done with our work days. Though there's still a lot of personal touches to add (like any photos on the walls), I'm excited that today, I can share with you one of our epic DIY's that has helped make this little apartment a little home for us! This is my mom's pink wicker kitchen table from when I lived with her over a decade ago. I think it originally came from Pier 1 (as so much of our home did). The seats had since been recovered twice with fabric that took it from its orginal beachy pink and blue to a totally different direction. Needless to say, it needed some TLC and a totally fresh work for our space. 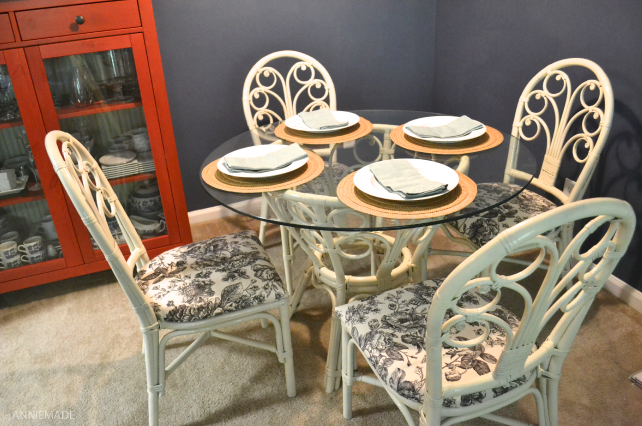 Get ready for this BEFORE, because you're going to see what paint color we chose for the dining space - yay! I mean, that looks settled right? What? You don't have an exposed bulb in your living room? That light is actually a recessed light that we bought a recessed light kit for. 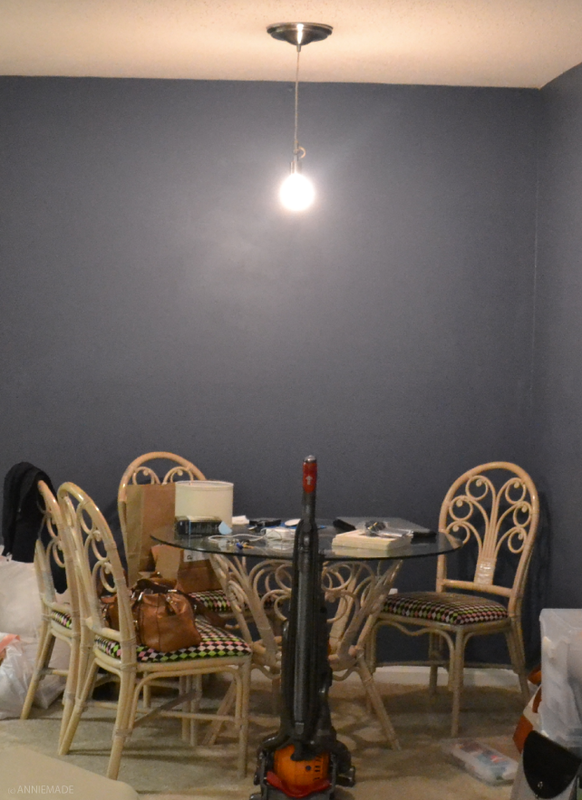 Don't worry, we added a shade and it looks pretty awesome for a quick $13 Lowes makeover. 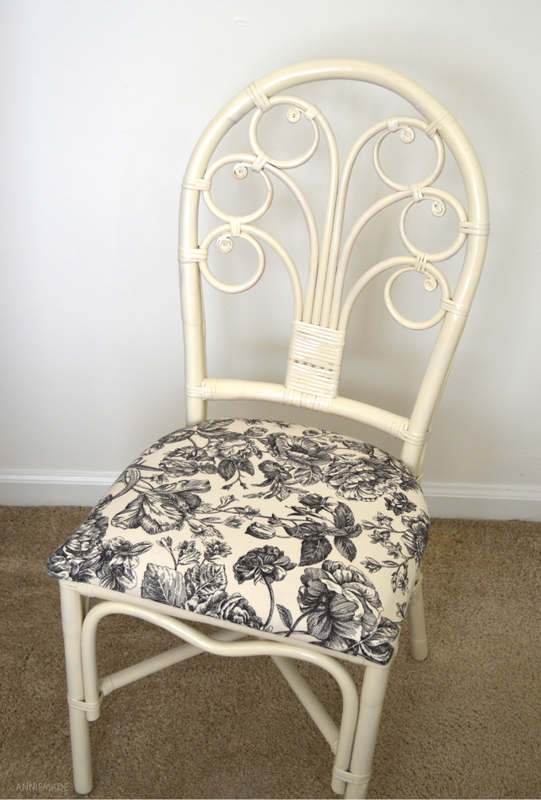 I used an electric drill to remove the screws holding the wood seats to the wicker and then set the screws aside. The next part took an entire morning, and I made the mistake of only starting with two spray paint cans. Since the table and chairs are wicker, it took at ton of spray paint to get all the nooks and crannies and a ton of paint went on to the drop cloths. Anyway, I did this on the patio and covered every surface in plastic drop cloths before spraying. Each chair and the table took a bit more than 2 light coats each. I'm happy with how they came out, but honestly, next time I'd definitely paint by hand for something this intricate. Anyway, we left them to dry for several days (took them off the porch after a few hours) and then coated them with finishing wax to protect the paint. 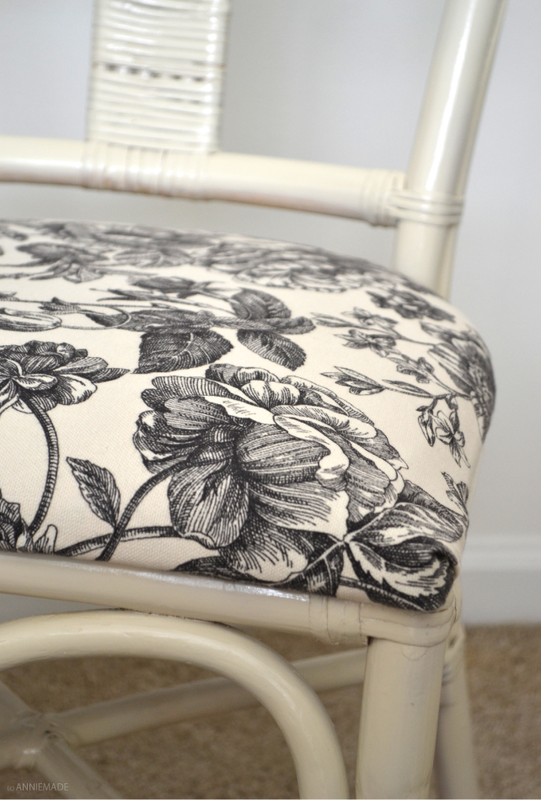 For the seats, I scored a great deal for this 50% waverly fabric - $7 a yard! Using a rotary cutter, we cut four squares that fit the seats (about 25 x 25"). We removed the old coverings and staples with a flat head screwdriver. 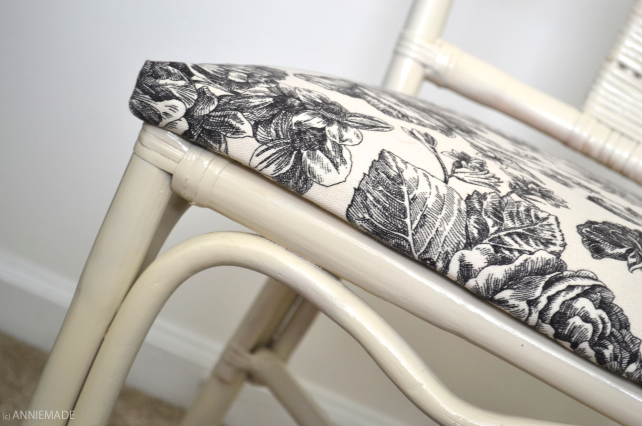 Then, and this is key, Gus and I worked together to staple the fabric onto the seats. We found it worked best to fold a side over, ensuring the fabric is as smooth as possible and holding it down for the other person to staple the fabric down taught. It took about 15 minutes per seat or so. Then, all that was left to do was another two person job, screwing the seats back into the chairs with the screws I had from earlier. This was probably the funniest step - I sat in each chair to hold the seats down while Gus got under the chair and added the screws back in. Fairly easy peasy. We're really happy with how much this has changed our space. The table, combined with our Ikea linen cabinet (used for china! ), and our linen shade fixture, makes it a lot more homey in here. And this isn't the only DIY painted furniture project we've done recently... stay tuned for more home decor fun in the future.